You can always count on Tiffany Haddish to be outspoken about her celebrity encounters. 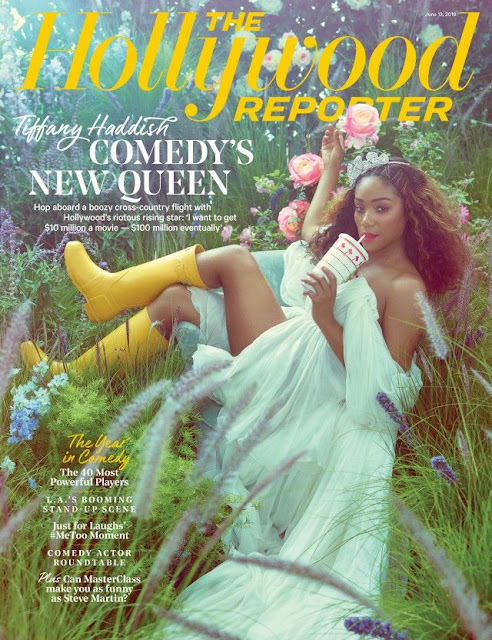 The 38-year-old actress-comedian covers The Hollywood Reporter's latest issue, and in the accompanying interview, shares her run-in with Leonardo DiCaprio. Haddish hasn't been shy about her crush on the Oscar-winning actor. "Yeah, I met him at a party two, three months ago, and I asked him if he'd let me hit that," she says. "He's like, 'Tiffany, you're so funny.' I'm like, 'I'm serious.' And then he goes, 'I mean, I'd do it, but …' I was like, 'Come on, wasn't you in a squad? The coochie squad or something?'" Haddish is of course referring to DiCaprio and his famous pals' group -- including Tobey Maguire and Kevin Connolly -- being dubbed the "pu**y posse" in the '90s. Haddish also said she made the actor laugh with a joke referencing his character in the 1993 film, What's Eating Gilbert Grape. "I told him, 'My only stipulation: I wanna do it with you as your character in What's Eating Gilbert Grape,'" she continues. "He starts bustin' up laughin'. 'Why?' he asks, and I say, 'Cause I feel like that performance deserves a real reward and that reward is this (gestures at her own body).' He starts goin' into how he got into the role, how he worked with these kids and all this stuff, and I'm just listenin' and listenin', like, 'Mmm-hmm, mmm-hmm.' I finally go, 'All that's good, I just need to know, When's this gonna happen?'" Aside from dishing on DiCaprio, Haddish later finally reveals the identity of the actress who she claims bit Beyonce. In March, Haddish told GQ that an actress bit Beyonce in the face at a party, and that the "Formation" singer stopped her from getting into a fight with the woman, whom she didn't name. Two sources previously told ET that it was actress Sanaa Lathan who "playfully" bit Beyonce in the face at an after-party last December following JAY-Z's concert. During Haddish's THR interview, she is asked if it indeed is Lathan whom she was speaking about, and Haddish smiles. "I'm super good friends with her stepmom and her dad [Stan, a producer-director], and they were mad at me," she says. "They were like, 'Why would you do this to the family? You know, black actresses, you guys have to stick together, it's so hard for you guys to get work as it is, why would you try to ruin her career?' But I didn't try to ruin her career. I never said her name! I was just trying to say how Beyonce kept me from goin' to jail that night. I coulda just shut my whole career down." However, Haddish says she didn't get any backlash after airing out the incident -- in fact, she's received even more invitations to celebrity bashes. "The other day, someone was saying, like, 'Oh my God, you should keep your mouth shut 'cause now you're never gonna be invited to parties,' but I got invited to way more parties after that," she notes. "It's ridiculous how many parties. 'Can you come to my party?' 'Can you come to my thing?' They want me to talk about something at their thing 'cause they think, like, 'This is gonna put me back on if Tiffany says something.'" ET last spoke to Haddish at the Met Gala in New York City last month, when she hilariously joked that she was ready to party with "rich men."